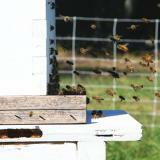 Use for beehive protection to keep out skunks, opossums, raccoons and small dogs. Vertical strings every 3 in. 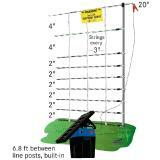 Line posts (built-in) every 6.8 ft., .51" dia. Post spikes (SS): .26" dia., 6" long. Built-in posts are closer together which means less sag and makes it easier to fence around curves and across uneven ground. Very close mesh spacing. The openings are 2" x 3" near the soil. Short. So it's easy to install and remove. Also, most adults can easily step over it. Adapts to curves, corners, hills and irregular shapes. Built-in posts are strong enough for ends and corners—if you move the posts within the fence. Ordering as kit includes extra posts for this. Because it's so easy to use and adapts readily to most situations, netting has become the way to protect hives from dogs, raccoons, skunks and opossums. Easier to step over and less expensive than VersaNet 11/30/3. White and black: Most easily seen by animals and people. Use when aesthetic needs are less important than visibility. Green: Less easily seen. Use where aesthetics are important and there is less likelihood of contact by uninformed human visitors. Netting Only—does not contain accessories. Choose support posts—as needed for ends, curves and corners.